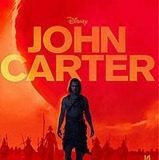 The avalanche of negative criticism aimed at the movie “John Carter” might be a plus at the box office. If nothing else, movie goers might just go to see if the film could really be as bad as the pundits say. And if it’s not absolutely awful, it might garner positive word-of-mouth, simply because expectations are so very low. Certainly that’s not the way Disney had pictured the marketing for their big budget picture would go – but hey, it might just work. “There’s nothing wrong with the epic science-fiction Mars adventure “John Carter” that can’t be fixed with a more talented lead actor, sharper direction, a smarter script, tighter editing and in-focus 3-D cinematography.” – Dann Gire, Daily Herald. Now I don’t mean to say that ALL of critics have given the film bad reviews. However, it certainly has become a punching bag for many. But guess what? Over at RottenTomatoes.com, the movie rates a whopping 90% as an ‘audience’ score for people saying they want to go see it (out of 13,349 votes). An opening weekend that is bigger than the scaled back predictions (currently $25 million) would generate some positive buzz as well. There is value in low expectations. Has the movie gotten your interest, and will you go see it this weekend? Leave your comments below.